At our Rockville chiropractic clinic we regularly treat victims of auto accident injury suffering from post-accident symptoms such as whiplash, back pain, neck pain, headaches and migraines. 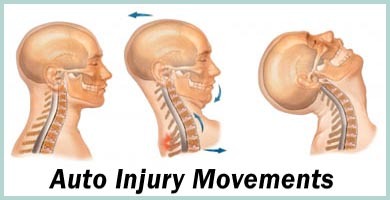 One of the most common injuries we see as a result of auto accidents is whiplash. Whiplash occurs due to the kinetic forces “whipping” your neck back and forth and side to side–past its normal range of motion. Whiplash can affect the muscles and other soft tissues in and around your spine and in your back and neck. It’s possible that you may feel neck pain, stiffness, and/or back pain and neck pain immediately following the accident. It isn’t uncommon for the symptoms of your injury to take several days, weeks, or even months to appear. Regardless, it’s extremely important to be evaluated treated immediately after an auto accident even if you’re not yet experiencing any neck or back pain. After your initial evaluation, our Rockville chiropractor may use manual adjustments, decompression treatments, mild electrical stimulation, ultrasound, corrective exercises, or other techniques tailored to help relieve your symptoms and to speed your rehabilitation.